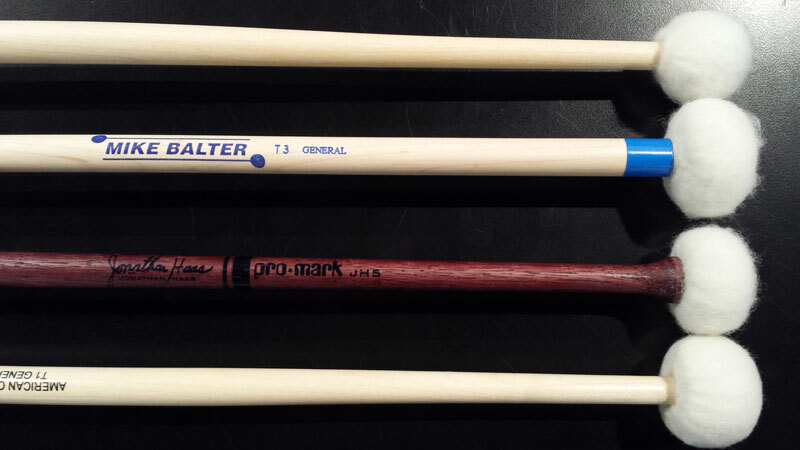 Welcome back to the Chops blog series on mallet FAQs (frequently asked questions). Late last year we addressed the mallet needs of the beginning and intermediate band and orchestra student. Today we’re going to discuss the needs of the advanced student. As an intermediate student reaches their senior year of high school, they should own mallets for marimba, vibraphone, timpani, and various accessory instruments. As they continue to progress, and eventually approach an advanced level, it is critical they have a wide variety of mallets available for those instruments. As we’ve discussed many times before, mallet preference is dependent on the individual percussionist. As an intermediate student gains experience they will develop their own preference for brands and models. The following recommendations, therefore, are general. For the glockenspiel (bells) and xylophone, the advanced student should at least have a hard and soft mallet choice. Plastic is the most common material for these mallets but other choices such as hard rubber or wood or hard rubber exist. For the glockenspiel, a metal mallet, either brass or aluminum is occasionally needed for the most bright and piercing situations. 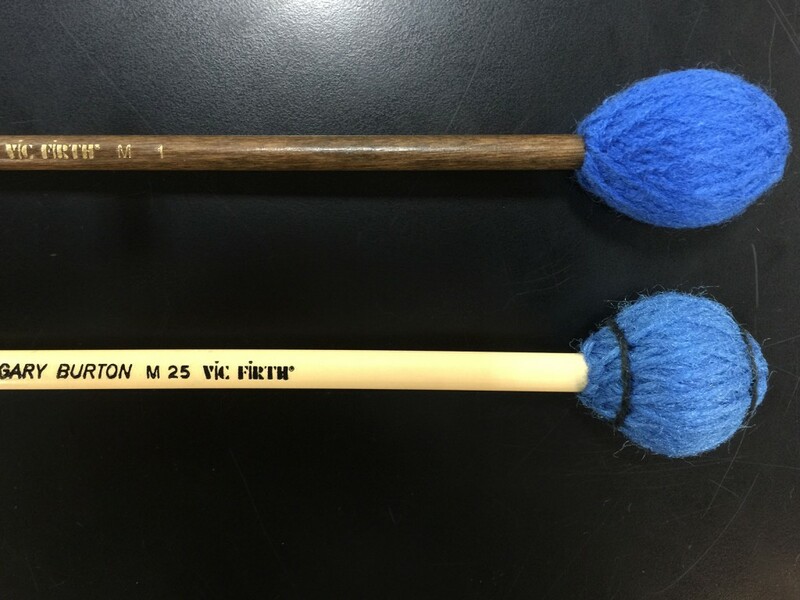 For the marimba, vibraphone, and timpani the advanced student should own a set of mallets in varying hardness, from very soft to very hard. The brand and models do not need to be consistent across the set, but should represent a wide variety of choices. Advanced students literature will commonly hold different mallet styles while performing modern four mallet marimba literature. 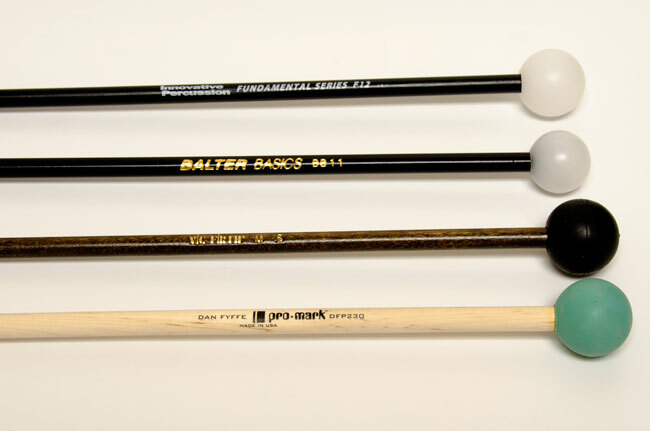 Finally, for accessory instruments, the advanced student should consider owning mallets for bass drum and gong. A medium, general purpose mallet for each instrument will generally suffice. For concert bass drum, a pair of smaller, “rolling” mallets is useful. Other implements, such as brushes, rods or rutes, and a set of triangle beaters are also needed. 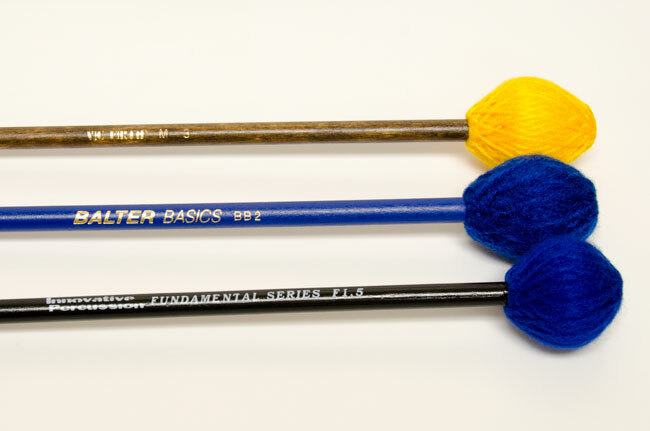 With a large variety of mallets available, the advanced student can perform well in any situation. If you, or your student are considering studying music, or performing after high school, it’s time to expand your mallet collection. Contact us for guidance, or to purchase mallets. Until next time, go practice! Welcome back to the Chops blog! Today we’re going to continue our series on mallet-related frequently asked questions (FAQ) by explaining the difference between marimba and vibraphone mallets. 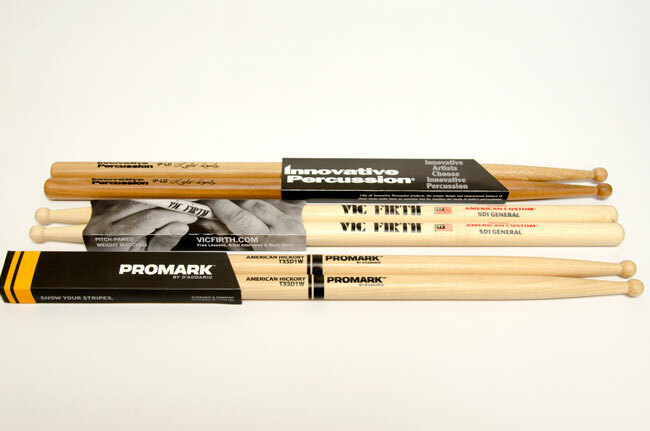 While they are very similar in appearance, and can sometimes be used for the same purpose, there are significant differences in marimba and vibraphone mallets. The differences between marimba and vibraphone mallets begin with the materials used in their construction. The head of both style mallets contain a rubber core, but the material wrapped around that core varies. Marimba mallets use a softer yarn than vibraphone mallets, which use cord. The harder cord and rounder shape of the mallet head allows the mallets to produce a clear sound from the metal bars of the vibraphone. 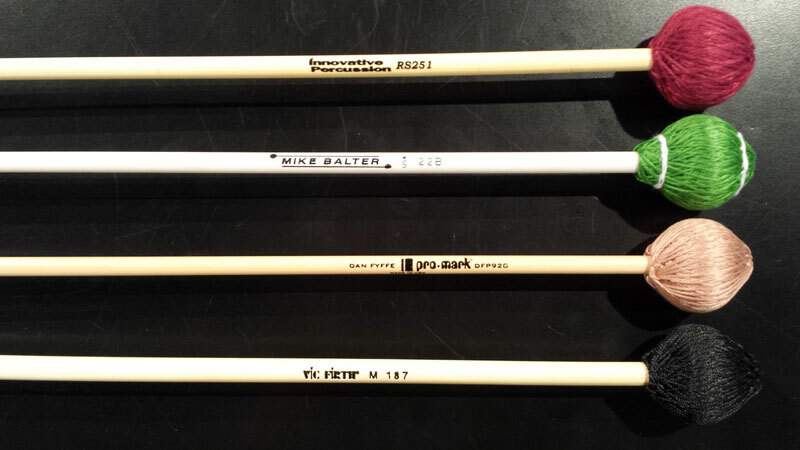 Note the differences in appearance between the Vic Firth marimba and vibraphone mallets below. The M1 on the left is a popular marimba mallet. The M25 vibraphone mallet on the right was designed by Gary Burton, the world’s foremost vibraphonist. Another important difference between marimba and vibraphone mallets is the material used for their shafts. Both are commonly available in birch or rattan, but marimbists and vibraphonists have different preferences. Marimbists typically prefer the rigidity of birch shafts, while vibraphonists favor rattan. Its flexibility is better suited to vibraphone techniques like mallet dampening. In addition to their respective instruments, both mallets can also be used to play suspended cymbals. In fact, they are preferred over timpani mallets, whose wood cores can be damaged and destroyed by the vibration of cymbals. If marimba and vibraphone mallets are very similar, can they be used for the same purpose? Yes, but only in certain circumstances. The soft yarn heads of marimba mallets limit their volume, and therefore effectiveness, on the vibraphone. However, vibraphone mallets can be used on the marimba for a clear, cutting tone. Jazz musicians who play both instruments simultaneously often choose vibraphone mallets for this purpose. In this video, Dave Samuels, with the Caribbean Jazz Project, uses vibraphone mallets while soloing on the marimba and then comping on the vibraphone. 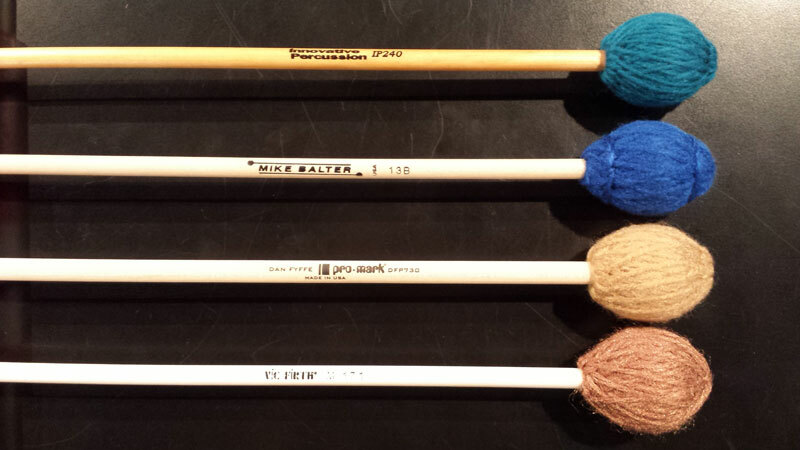 Advanced percussionists, such as high school or collegiate students should own both marimba and vibraphone mallets. Serious soloists will have several sets in varying styles and hardness (see our previous mallet FAQ on marimba mallet hardness) available in their mallet bag. We hope this guide has helped you understand the difference between marimba and vibraphone mallets. Please contact us for assistance choosing mallets or for recommendations. See you next time!